The World Heritage Tombs of the Ancient Koguryo Kingdom represents exceptional testimony to the vanished Koguryo civilization. The Capital Cities of the Koguryo Kingdom are an early example of mountain cities, later to be imitated by neighbouring cultures. The tombs, particularly the important stele and a long inscription in one of the tombs, show the impact of Chinese culture on the Koguryo (who did not develop their own form of writing). The paintings in the tombs, while showing artistic skills and specific style, are also an example of the strong impact from other cultures. Of the medieval cities in north-east Asia, Guonei City and Wandu Mountain City are both masterpieces of capital city layout and construction. They witnessed the splendid civilization that was created by Koguryo and submerged in the long process of history. They were the capitals of the Early and Middle Koguryo (1st-5th centuries AD), noteworthy for the fact that the plains city and the mountain city were supporting each other and jointly functioning as the capital. Guonei City played the role of a supporting capital after the main Koguryo capital moved to Pyongyang; it is one of the few plains city sites with stone city walls still standing on the ground. 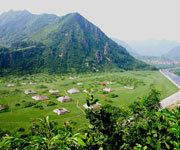 Wandu Mountain City contains many remains, including a large palace and 37 tombs. Some of the latter have elaborate ceilings, designed to roof wide spaces without columns and carry the heavy load of a stone or earth mound that was placed above them. The city, built along the terrain of the mountain and rationally designed, perfectly realizes the harmonious blending of natural environment and human creation. In addition to Guonei City and Wandu Mountain City, there are some 7,000 tombs of the Koguryo period (Donggou Ancient Tombs) in the Tonggou Plain surrounded by mountains. Among the tombs, the ten large-scale Koguryo imperial tombs represented by the General's Tomb and Taiwang Tomb, along with a large number of aristocratic wall-painting tombs, are the epitome of Koguryo's high architectural and artistic achievements. The Haotaiwang stele on the east of Taiwang Tomb has an inscription with Chinese characters. This is the longest Koguryo written text so far known. What is especially important is that the blending of a local culture with its neighbouring culture, in particular the cultural elements from China's central plains, is amply illustrated by this World Heritage site.